Dear readers, I create this post because I heard many terrorism issues that tend to be associated with Islam as religion. But through this post I want to say that it is NOT TRUE. If you say that it is personal responsibility, then I’ll say yes. I know some of you may be asking within the heart "Why you say that?" Rob was a long-term Indonesian resident until just a few months ago. … The sooner anti-terrorism forces catch this man the better. Otherwise, Indonesians can be assured of one thing; he will continue to build bombs designed to kill as many people as he can for as long as he can. He, and his group, might be targeting foreigners, but history shows he is not adverse to killing Indonesians as acceptable collateral damage in the pursuit of his goals. Violence is not the answer. It will never resolve our differences and it will never allow us to move forward to a place where we all live in peace and harmony with one another. People of all faiths must denounce violence as a legitimate means to an end; violence is not legitimate and it never ends. What distinguishes these two posts from anything I might say is that they are based on deep experience of the context and people concerned. What distinguishes the hope and counsel they offer from the usual punditry or over-generalisation is that same authority and authenticity. Friday poem 14: not really a poem! In the latest South Sydney Herald Adrian Spry contributes this on the back page. On a drear early morning, mid-year and hand-numbing cold. Greyness seems juxtaposed upon grey. The morning mist shrouds the Waterloo towers, making them seem ceilingless. They seem to climb heavenward forever. Walking – walking downhill. My normally constant chatter with my children is missing. We are all lost in our own thoughts. Coming to terms with the start of a new week. The start of a new day. The grind of everyday life. Comprehension dawns as my eyes give credence to my mind’s film. I take in the scene. Martial artists on the basketball court. 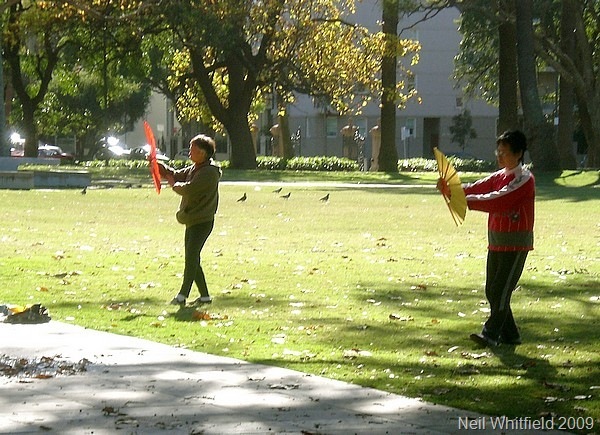 The “crack” is the snapping of fans in unison as the three artists perform the tai-chi Kata or dance. Brightly coloured as oriental fans are. Exotic. Ancient. As we watch we seem to lighten. Awaken. And now I notice the green of the grass. The towers and buildings. I see the gardens bright. I sense all this world around me. Ahh yes… with smiles we three carry on. As we bend the corner into Cooper Street my daughter laughs and skips. My son smiles on. My daughter speaks. “Dad, those Chinese people look great.” They do. Yes. The rhythm of life. … Although Hand in Hand is bi-lateral, this film isn’t. It’s Israeli. This will immediately scream ‘bias’ to some audiences. But hold on a minute – and I say that sincerely as I am the most sceptical of audiences on such matters. As an Israeli film, I still feel it bends over backwards to illustrate both sides. Often quite emotionally. And the sincerity of all concerned can be painfully moving to behold. Views expressed are mostly of the children. Children educated in each other’s languages. Each other’s religious beliefs. Respecting their own culture, but partaking fully – yes, fully – in the opposite culture. "I’m a total atheist," says one parent. "But I’m Jewish." She is not making some subtle academic point about the separation of Jewish culture and religion. As a parent who’s sent her child to Bridge over the Wadi school, she is already a ‘tolerant’ member of her community, and is consequently looked at askance by many of her neighbours. Yet her tolerance soon begins to waver. She exclaims that Arab parents must think she is "a sucker" for letting her Jewish kids say "Allah is great". We then hear from her the familiar, archetypal, emotional (if disingenuous) homilies about Exodus and about the Holocaust. She removes her child from school. Bridge Over The Wadi packs a tremendous emotional punch. It doesn’t offer complete answers. It does show a significant attempt to move forward in reciprocal understanding rather than mutual narrow-mindedness. My main criticism is that it still seems a little smug. It fails to give any noticeable credit to the Initiatives on which the documentary is based. It simplifies facts. For instance, considering the vast lengths Hand In Hand go to for accuracy, it seems disrespectful that filmmakers round out the numbers of pupils – applications ‘doubled’ in the second year – they actually increased very significantly. Or, suffering the little children perhaps, should they have omitted to mention that Christianity is also taught alongside Islam and Judaism? But Bridge Over The Wadi is an impressive piece. One I recommend. It succeeds in presenting issues in a captivating way, without assuming detailed prior knowledge of Israeli-Palestinian relations. One of the extraordinary things about five-year-olds anywhere is their sense of discovery about the world. Their unaffected and unconscious grasp of what is before their eyes. When they put their cross-border friendships before age-old enmity, the reasoning out of their mouths puts the complex negotiations of adults to shame. That really says it all, and I agree wholeheartedly. See also my Vodpod on the right down the page. Those who close all girls’ schools wherever they have the power to do so, who murder all their opposition, favour terror as a weapon, make their God a gun, and are driven by a crazed and extreme version of the worst aspects of the Abrahamic faiths – the Taliban and their supporters. What more can you say? The poor people of Pakistan — a country M visited in 1999-2000 and loved, having met with nothing but hospitality and honesty wherever he went, which included Peshawar and much of the North-West Frontier. But what a different story today, thanks to Bush’s foreign policy, past neglect of the key significance of Afghanistan/Pakistan – the borders really are notional – and the sideshow that was the invasion of Iraq, even granted that things there are somewhat better. But it is chilling to realise that whatever one’s hopes of peace the Taliban and company do not want peace, except their own peace – and that is what you just read in the first paragraph. That is not a peace the world can live with, even less the people of Pakistan. And yes I know what a quagmire Afghanistan/Pakistan has been for all who have ventured into it – the British, the Russians, and now NATO, the US, and our own military. Earlier US Cold war policy directed against the dying USSR in Afghanistan nurtured the monsters. Before you comment on this post, carefully review the Four Corners program linked to that image. Before you start rabbiting on in a generalised way about Islam, consider that all the people we see in that program – terrorists, cultists, fanatics, and their victims – are all Muslims. There are indeed Muslims and Muslims. Jihad-watch style reaction does not help. You don’t have to demonise the Taliban; they do that very successfully themselves. The dilemma — and what a dilemma! – that the program also brought out is that heavy-handed military “solutions” quite often strengthen the Taliban and such groups. Can’t help thinking though that it would be in everyone’s interests if India and Pakistan could bury their differences in the light of the common threat they confront. Nor would a just solution to the Israel/Palestine issue go astray – that being another running sore in the background to all these events. Glad I just run a blog, and not the world! Friday poem 2009 #2: perhaps the shortest ever! From the site Poets Against War. Comments Off on Friday poem 2009 #2: perhaps the shortest ever!